The perfect way to impress your sweetheart is with sweet treats! Our Valentine's gifts are a great way to impress those dear to you. Choose from our delightfully decorated, heart-shaped Kringle, a handmade cake or one of our heart shaped delights made especially for your special someone. Danish Cherry Bread Pudding — $24.99 We pride ourselves when our ingredients include fruits grown in our home state of Wisconsin. 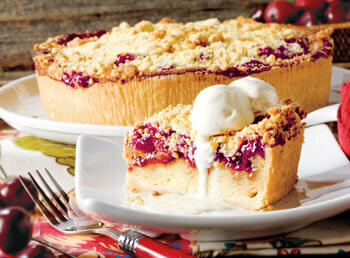 Our homemade cherry filling made from tart cherries grown in Door County combined with Danish pastry soaked in vanilla egg custard and topped with buttery streusel. Warm the cherry bread pudding and add a dollop of your favorite cream topping or spoonful of ice cream for an extra special treat. 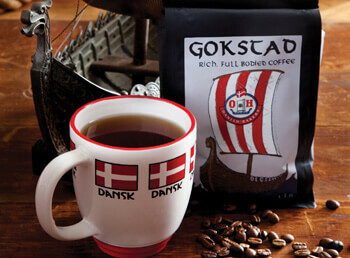 Gokstad Premium Whole Bean Coffee — $18.99 Named for one of the finest Viking longships, Gokstad is a coffee that lives up to the Viking spirit. It combines a rich, full-bodied dark roast coffee with a sweet, clean light-roast to create the perfect blend of flavors that only a master craftsman who is fiercely proud of his work could make. 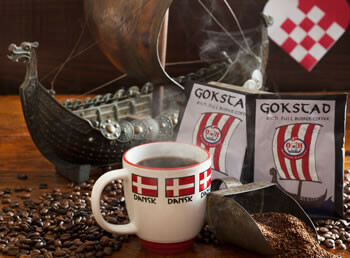 We work with only the best suppliers and roasters who source coffee directly from it's origin. It's then roasted locally by hand and delivered fresh to be sure that, just like our pastries, the entire coffee experience is great.